Google faces a record anti-trust penalty of about 3 BILLION Euros (US$3.4 Billion) from the European Commission in the coming days, according to reports. After 7-years of the investigation, the European Commission filed anti-trust charges against Google last year for violating antitrust laws. The European Union accused the search engine giant that it had abused its dominance in search by unfairly prioritize and displaying its own comparison shopping service at the top of its search results at the expense of rival products. British newspaper The Sunday Telegraph reports that the European Union is currently preparing a fine of about 3 Billion Euros ($3.4 billion), which is almost triple the amount (1.06 Billion Euro) that Intel was levied several year ago over violating antitrust law. According to the newspaper's sources, the EU officials, led by Margrethe Vestager, are planning to openly announce the fine against Google as early as next month, although the exact figure of the fine has yet to be finalized. 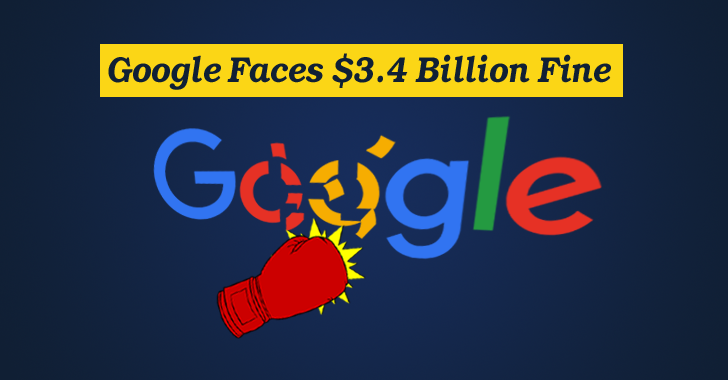 Reportedly, the European Commission regulators can impose a maximum penalty of up to 10 percent of the company's annual sales, which, in the case of Google, is possibly more than 6.6 Billion Euros. Not just fine, but Google will also be banned from manipulating its search results in the region so that it does not continue to favor its homebrew products. In a separate antitrust case, Google has also been accused of abusing its dominant position in the smartphone industry with Android by pre-installing its own apps, like Google Search, Chrome, YouTube, Gmail as default apps, making it harder for other companies to compete. "Anyone can use Android with or without Google applications. Hardware manufacturers and carriers can decide how to use Android and consumers have the last word about which apps they want to use," Google spokesperson says. The EU is also looking into the transparency of paid reviews and the conditions of use of services like Google Maps and Apple's iOS mobile operating system.